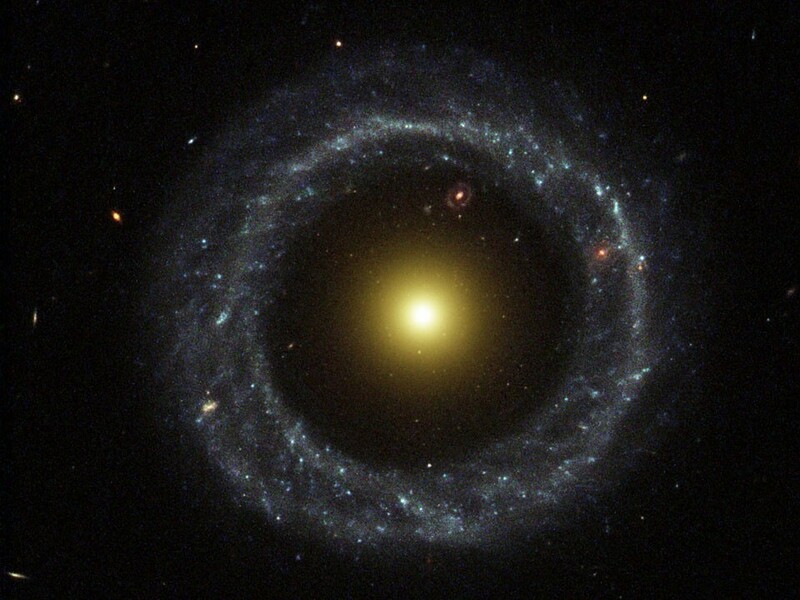 Hoag’s object is perhaps the most famous example of a rare type of galaxy known as a ring galaxy. It is comprised of a core of older stars surrounded by a ring of young hot blue stars. When it was first discovered by Arthur Hoag in 1950, it was thought it might be an example of the gravitational lensing of a more distant galaxy by a closer one. Later observations showed that the ring and core have the same redshift, and so are of equal distance. More recent images such as the Hubble view seen here clearly indicate that the usual shape is not due to lensing. The galaxy really is shaped the way it looks. Just how it got that way is a bit of a mystery. 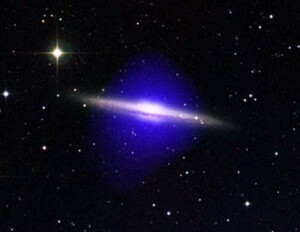 One idea is that it formed through a collision with another galaxy, but the core and ring of Hoag’s object move at the same speed, and there is no evidence of a galaxy in the vicinity that could have acted as the “bullet”. So this doesn’t seem very likely. Another idea is that the galaxy began as a barred spiral galaxy, and then experienced what is known as a bar instability. Basically the central bar region of the galaxy is ripped apart, leaving a central core and outer ring. Some computer models support this idea, but others don’t. So at the moment we don’t have a clear understanding of its origin. But it is a wonderful object to observe, which is why it is so popular among amateur astronomers.